Whenever I go places and wear my SGI t-shirt I’m always surprised by how someone always recognizes it. Whether it’s just mutual drooling (these were the computers that every animation house was using and every 3d animator was lusting for), or a story of someone that once worked there, it’s always interesting. I bought an old busted Octane2 case recently. Originally, the Octane2 sold for around $25,000 for a base configuration and went up from there to $60,000. This chassis cost me about $200 but honestly, if it worked it wouldn’t have been worth much more. Oh how things change so quickly. The machine is barely 10 years old. 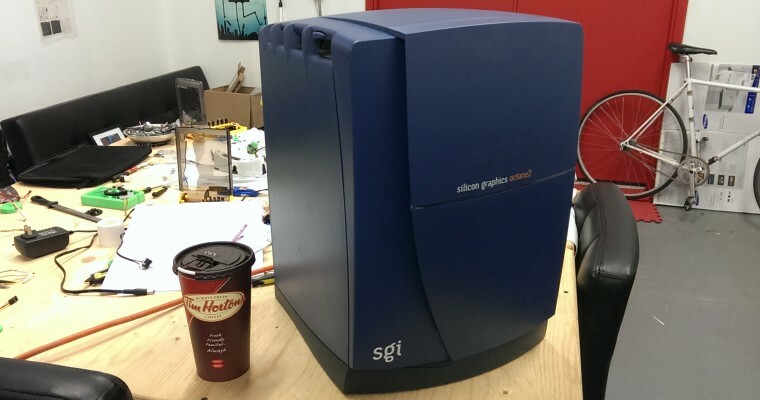 Anyways, SGI systems still look incredible to my eye, as they were something I could never afford. I’m going to convert this one into an ATX system when I have time and put my core i7 inside it. As far as I’m concerned this beats any boring normal case, while also screaming history.